Electricity costs in 2013 per KWh increased for the Commercial and Industrial sectors over most of the country. As a result, however you define normal business hours, most of you are paying more to keep your doors open and the lights on. State by state and regionally results were mixed for both sectors as costs seemed to generally keep pace with inflation. How can I reduce this fixed business cost? Although most businesses have few "peak use" options, some providers have changed their pricing model to reward businesses who can avoid power hungry processes during peak hours. 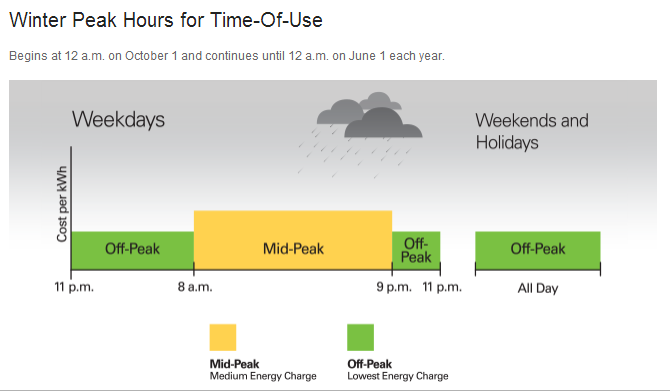 By example Southern California Edison (see below) has taken this concept is a step further by offering a different peak hour structure in Winter and Summer months. Unfortunately, for most businesses the lights must stay on 10 - 16 hours a day. For businesses that have "stand alone" parking areas, the tab keeps adding up 24 hours a day. So, for every business lighting simply becomes a fixed cost. Fortunately, we have a solution that will reduce the lighting bill 50 - 70% month after month. An added benefit, the science we use to design the lighting plan will most assuredly improves the quality of light - leading to increased sales and productivity. We want to help you get off to a Green 2014. Give us a call today or "just do it" by faxing the most recent 12 months of your electricity bills to (213) 210-2188. We'll make the process easy and you'll look like the genius you have always been. It's a great strategy for your 2014 bottom line!